Here midweek on Cape Cod the temperature has dropped and we had a bit of rain, but the forecast for tomorrow is sunny and back into the 80-90s. The blast of cool air has me thinking about my fall wine selections for guest at our Cape Cod Bed and Breakfast. After the exciting “best bottle” tasting I blogged about last week, I have a renewed interest in both Merlot and Chardonnay. What a stroke of luck, last Wednesday night’s Belfry wine tasting, co-sponsored by Cellar 55 Wine Merchants, was entitled “An Evening of Chardonnays”. The tasting presented four wines from various locations in California. Spencer from Horizon Beverage Company was our guide as he communicated how and why four very different styles of wines can be produced from the same grape. As he explained, Chardonnay is a grape that will reflect the region, the “terroir” as the French would say, which literally means the “soil”. In addition, the weather during the growing season and harvesting conditions influence each vintage. And finally, the finished wine will reflect the choices made by each winemaker. I always learn something new at these events and of course I get to enjoy some great wine and food pairings. We started the evening with a 2009 Valley of the Moon Unoaked Chardonnay. 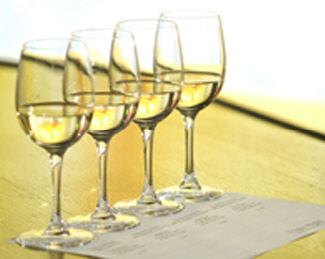 Many consumers may say that the key characteristic of a California Chardonnay is oak. The “big”, over the top, heavy oaked Chardonnays are equally praised and criticized for the effects of the oak on the true nature of the grape. Spenser suggested that this wine was similar in style to a White Burgundy, which is a chardonnay grape based wine that sees little new oak, i.e. is less influenced by oak; which helped explain to me why I like this wine. Last week at our best bottle tasting, I was very impressed by a 2001 Chassagne-Montrachet, a great white burgundy. To start with completely unoaked chardonnay was very educational. The next wine was a 2006 Sonoma Cutrer Sonoma Coast Chardonnay. Sonoma Cutrer is a larger winery and may have more name recognition than Valley of the Moon. Both wines are made from Chardonnay grapes form Sonoma, but one more coastal and other more inland. The Cutrer is also a few years older and spent time in new French oak. So we have two Chardonnays from Sonoma, but two very different wines. The next wine was the 2007 Chateau St. Jean Robert Young Chardonnay from the Alexander Valley in upper Sonoma County. The source of the grapes was the Robert Young Vineyard. Some of us remember Robert Young from his days as a TV star on the 1950’s program “Father Knows Best”. He also knew a lot about wine, and clones of Chardonnay grapes he developed fifty years ago are still producing excellent wines. The last wine was a 2007 Chalk Hill Chardonnay also near Alexander Valley. Their website speaks to Spenser’s earlier point about terroir, …”At Chalk Hill, each vineyard block has been delineated and planted based on the accumulated knowledge of soil profile and chemistry, aspect (orientation to the sun), slope (vertical degree impacting potential for drainage), and overall climate. Terroir divines our plantings, without regard to what may be fashionable today.” The winery’s name suggests the strong dusty taste of chalk, which is found in each glass of this wonderful wine. 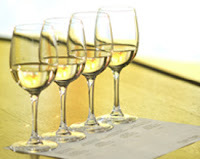 So, we had four California Chardonnays that each gave a unique experience based on the many factors that make winemaking, and thus wine tasting, so fascinating. I have added the Valley of the Moon to my list of wines to be served this fall to guests at our Sandwich inn. I am now in search of a merlot to combine with it as the weather cools. Wish me luck.